Okay, I'll admit it. I sometimes feed my family frozen pizza. Sigh. Surely I'm not the only one? Well, at least I did give them a yummy salad to go along with it, right? Doesn't that count for something? HA!!! 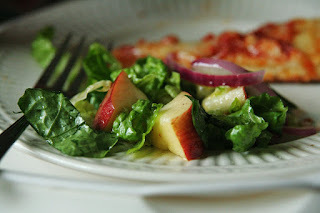 Place lettuce, apple, and onion in a salad bowl. Place oil, vinegar, mustard and honey in a small plastic container and fit lid on container. Shake dressing to combine, 1 minute. Pour dressing over salad, toss, and season with salt and pepper, to taste. That salad looks great! I have been known to serve frozen pizza now and then. I'd like to be super woman and have a healthy, home cooked meal everynight... but I'll never be super woman. Sigh. That's a lovely looking salad! When my children were small, I was embarrassed when someone came to the door and my son said, "Are you the pizza man?" Our family loves pizza -- homemade, ordered, frozen -- any kind. But, I realized that I was ordering it too often! Once in a while we have frozen pizza too or pizza from Costco the Take and Go. I throw together a sald too. Your salad looks great. You could try the granny smith appleas with dried cranberries and walnuts. It is yummy!